No, this is not an early April fools, but a example of what can be done with a little creativity, the latest technology and a touch of silliness! Professor Stephen Heppell is an education expert who each year brings together students of all ages to his stand at the BETT Educational Technology Tradeshow in London. This year, students ranging from 9 to 34 years old were challenged to make stuff using the latest technology. The only rules were that whatever you made must be different, innovative and done collaboratively. Each day the best projects were demoed to the show visitors on the central stand. How does this involve R/C helicopters you might be wondering though? Well, helping on the stand were Tom Stacey from Rotorworld and digital making group Chelmsford Makerspace, big fans of R/C models. Tom and Makerspace challenged themselves to control a Parrot AR.Drone using a Raspberry Pi computer instead of the more usual smartphone controller. This was enough of a challenge as it was because the Raspberry Pi doesn’t have Wifi, an app (it runs Linux) or a screen, but ingenuity wasn’t going to prevent that! After getting the Drone to fly from the command line using written, and then keyboard commands, the team decided that it needed a controller. After rejecting the idea of an Xbox controller, they decided that using bananas (the fruit) would be more fun and using something called a MakeyMakey kit, cobbled together the finished article. Flight performance wasn’t quite up to the standard you’d get with the original apps, but as you can see from the videos, it does fly, and is controllable. 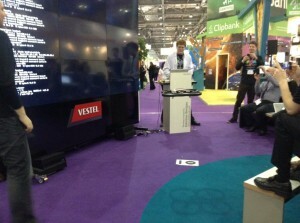 The demo certainly pulled in a big crowd, and even Rob Bishop from the Raspberry Pi foundation was in attendance!